This very simple kit includes the bare minimum tools needed to perform a ribbon cutting ceremony--an industrial ceremonial grade hard hat and a steel polished shovel measuring 42 inches long. The hard hat is available in a variety of colors such as black, yellow, red, royal blue, green, light blue, orange, white, silver, and gold. A groundbreaking ceremony is an exciting event for organizers; not only does it provide for them to introduce their business idea to the world, it also makes for a great publicity event. Owing to these reasons, it is preferred that the ceremony go as smoothly as possible. Ensuring a smooth ceremony can come down to something as simple as making use of the good quality that perform as well as they look. 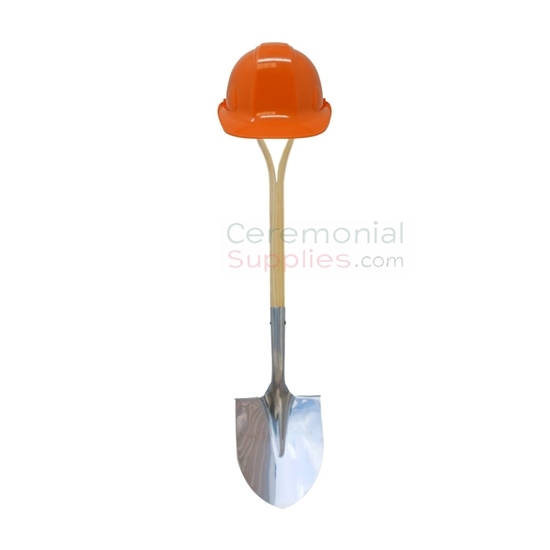 The Groundbreaking Basics Kit is composed of two of the highest quality tools essential to the ceremony; chiefly a ceremonial hard hat in a color that you choose and a shiny, polished steel ceremonial shovel. This is just one of the many kits available when it comes to groundbreaking ceremonies, and for more such kits of varying sizes, feel free to go through the Groundbreaking Kits section of CeremonialSupplies.com.